Stock # 419149A, Diesel V8 6.4L/, 236966 mi. 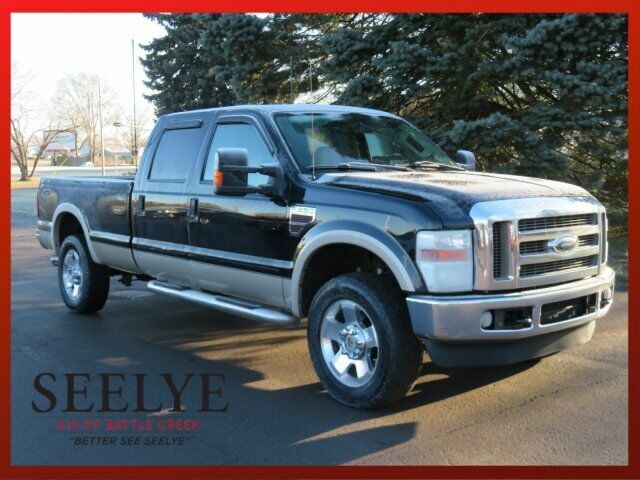 This 2008 Ford Super Duty F-250 SRW is loaded with top-line features. Trailer tow pkg-inc: 7-wire harness w/relays, 7/4 pin combination connector, trailer brake wiring kit w/o controller, Tire Pressure Monitoring System, Stationary elevated engine idle control (SEIC), Removable locking tailgate w/black handle & Tailgate Assist. Rear seat LH/RH grab handles, Rear license plate bracket, Pwr steering, Pwr 4-wheel disc brakes w/vacuum boost, Pickup box/cargo lights, Mono-beam front axle w/coil spring suspension, Interval windshield wipers, Instrument panel mounted storage bin & trash bag hook, Glove Box, Front/rear map lamps, Front stabilizer bar, Front passenger-side roof ride handle, Front license plate bracket *Standard in states where required. Optional in all other states. *, Front fender vents, Front door operated dome lamp w/time delay off & IP switch, Engine block heater *Standard in AK, CO, IA, ID, ME, MI, MN, MT, ND, NH, NY, SD, VT, WI & WY. Optional in all other states. *, Dual color-keyed coat hooks, Driver & passenger grab handles, Driver & front passenger airbags, Dash-top tray.